Mozzarella sticks are delicious – there is no denying that. 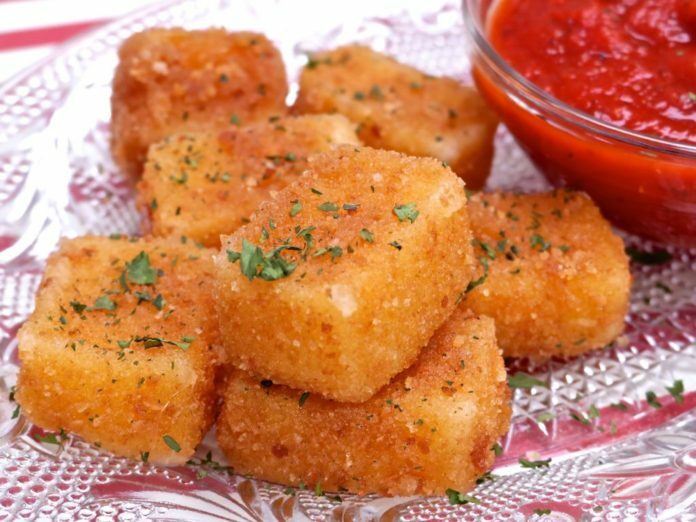 But have you ever tried mozzarella bites? Same delicious treat – just in easy bite size samples. These treats are perfect for while you and your family are watching a movies or playing games. Heat medium skillet over medium heat. Add 1/3 cup panko to pan and cook for about 2 minutes or until toasted, stirring frequently. Remove from heat and place the panko in a shallow dish. Stir eggs into a scramble mix into s shallow dish. Cut mozzarella sticks into 1 inch pieces. Working with one piece of cheese at a time, dip cheese in egg mixture; dredge in panko. Place the cheese on a baked sheet that has been coated with cooking spray. Bake at 425° F for 3-5 minutes or until cheese is softened and thoroughly heated. Serve immediately with a sauce of your choice.